While the Czech Republic is an extremely modern and developed country, they lack the resources, support, and advocates for individuals with autism. The country is still in the process of recognizing autism as a disorder, and there are no BCBA’s that live in country. 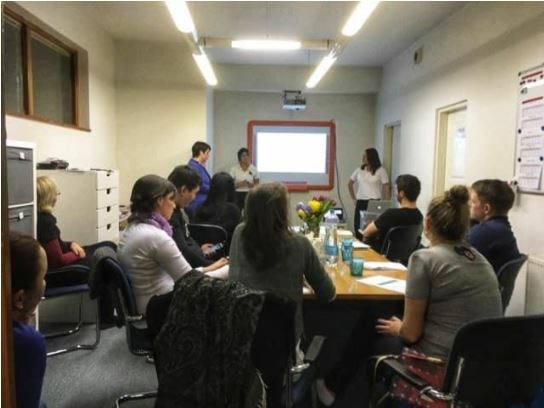 Despite the obstacles that professionals in the field of ABA face in the Czech Republic, the center staff are outstanding clinicians, and their passion and dedication to the work they do with their clients is unparalleled. There are many reasons why conducting a parent training is difficult in the Czech Republic. Due to the cultural differences and the questionable validity of information that parents may receive in this country, stressing the importance that ABA is evidence based was our biggest task. The main concern that center staff relayed to us, is that parents are uninterested or unaware of why data collection is necessary. In the Czech Republic, families pay for ABA sessions out of pocket. There is no government assistance, and there is no medical insurance policy that aids in this type of therapy. According to center staff, there is an ideology in the Czech Republic that since families are paying for each session out of pocket, they want the therapist to be working with their child the entire time. This means that they don’t understand why a therapist would take time out of their session to record data—this “takes attention away from the child”. According to these parents, data takes time away from the therapist that could have been spent working with their child. On day 1 at ABA Centrum in the Czech Republic, we were informed by the center staff that they would like us to facilitate a parent training night on the second to last evening of our time here. That night, my team and I discussed the logistics and the topics that we would cover within the presentation. During our parent training, we discussed the importance of data collection, and why it is so important to be recording accurate data. We stressed the significance of long term goals, and that taking data is the only way to measure the progress a child is making. During the 2 and a half hours we trained, we watched as the parents began to open up. We saw them begin to ask questions and share their own stories. And then, something magical happened. As we stood at the front of the room, we watched the transition occur from parent training to parent support group. For most of these parents, this was the first time they’ve ever felt like they were in a safe space to discuss the obstacles that they face having child with autism. The parent training extended 45 minutes past the original training time. Everyone was so lost in sharing stories, experiences, highs, and lows, that they weren’t paying attention to the time. The relation these parents felt was so tangible, and witnessing them connect before our eyes was a feeling I’ll never forget. My hope for this center is that they continue to facilitate more of these parent support discussions, and allow them to have more opportunities to communicate together in this safe space. This is amazing! It brought tears to my eyes to think of the impact that this training has had on the these families!